I believe the best rewards in life come from making oneself vulnerable. To that end, I approach my work each day in way that allows for experimentation free from fear of failure (okay, sometimes I’m slightly afraid, but I don’t let it hinder me) because we learn from both our successes and our failures. With the opening of a Renzo Piano-designed wing in January 2012, the Isabella Stewart Gardner Museum ushered in the next phase of the museum’s history. The spectacular architecture and increased focus on contemporary art (the museum’s Artist-in-Residence program celebrates its 20th anniversary this year) has provided increased opportunities for making connection between the historic and the contemporary. In reflecting on An Elastic Manifesto for Museums, I thought about our Living Room Project. Domestic in scale and design, the Living Room functions as both visitor orientation space and contemporary art project at the same time. Inspired by the 2000 exhibit The Living Room by artist-in-residence Lee Mingwei, the room is designed to foster visitor learning and interaction in creative ways. In addition to collection resources and trained volunteers, twice a week visitors encounter a “living sculpture” in the form of a guest host who shares personal objects. While much of what the Manifesto is about is relevant to this project, I’ve reflected on a few key points. By its nature, the Gardner is a different kind of museum. The arrangement of the collection, housed in an imaginative Italian palazzo with a central lush courtyard, is eclectic and seemingly idiosyncratic in many instances. And there are no wall labels to identify and explain works. The installation was a personal endeavor for Isabella Gardner. However, she is not here to tell us the stories behind her pieces or her personal connections to those objects. Mingwei’s Living Room Project asks hosts to take on that role by choosing objects of personal significance and engage with visitors in conversation about those objects with the hope that visitors get into the mindset of thinking about and discussing works of art in a way that includes personal meaning and emotions. This experience is a bit unique and can befuddle visitors, especially the idea that this interaction is a work of art. Mingwei’s work is something that is “made” not entirely by him (he only comes to the museum periodically); the work of art is the experience of the host and visitor interacting in a unique moment. In that way, the work of art (like all works of art, I would argue) is different in each encounter and for each visitor. This is definitely a different kind of museum experience for most visitors. So far, they have welcomed and embraced this new opportunity. At its core, the Living Room project is about basic human interaction—one person learning about another person through sharing personal stories. The rewards of this open ended activity are powerful and what better place to encourage this than in a museum setting. The rewards for me as a staff member have also been great. Because we are expanding the museum’s role in the larger Boston community, I have had the chance to meet some amazing people who I may not have met otherwise. Hosts do not have to be “museum people,” although many curators, educators and staff have participated. We’ve had artists, students, professors, lawyers, ballet dancers, and many more. I have learned something different from each one of them. This sociability, togetherness and relationship building is the foundation of the Living Room project. It not only enriches our visitors’ experience, but also feeds the souls of the staff. Last, but certainly not least, is the idea of letting go and trusting others. Mingwei’s work, the Living Room project included, explores issues of trust, intimacy, and self-awareness. Each week, I marvel at the generosity in which each host has shared a bit of himself or herself with our visitors through their stories and objects, often very personal and precious. For some this might be the scariest part of such a project; I essentially give control over to the hosts and trust it will work out as best it can that day. That’s a hard thing for most of us to do (me included), but it is essential for a project that is about multiple voices and building community. The Living Room project is a work of art that belongs to Lee Mingwei, the museum, and every host and visitor that participate. That is a novel way to consider a work of art, I think. But that is what makes it powerful, successful and beautiful. “The best rewards in life come from making oneself vulnerable. ” I am touched by such words. It is through opening up ourselves that we gain more access, sense of security and peace to the world around us. It is by not being afraid, by trusting, by loving and believing that we grow stronger, understand more and share more. Thank you for your comment, Chinesearthistory. Museums can and should be places where our visitors are given the opportunity to grow stronger, understand more and share. Interesting post and interesting idea! I have not been to the Gardner, and I think I would find the lack of wall text to also be a different experience. I’m curious whether you think that having people come in to talk about the art is in line with, or if it rather detracts from, the original reasoning behind not having explanatory text. Does having an explanation at all, albeit a verbal one, take away from the spirit of not having any written explanation? Or is this verbal, interactive explanation more appropriate for the Gardner, since it’s dynamic rather than static? 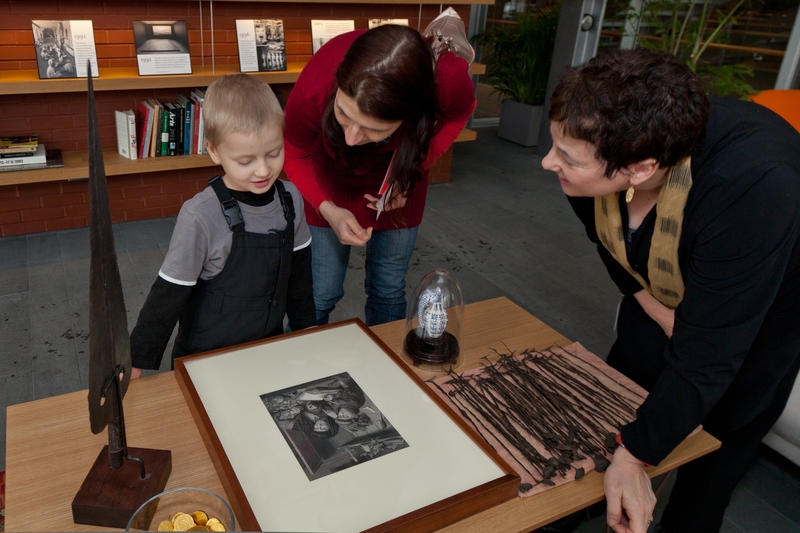 Laura, Our approach to teaching at the Gardner is visitor-centric and open-ended, so our gallery discussions are not so much explanation as they are discussions aimed at helping visitors look closely, think critically and make meaning of the works of art. In that way, we continue the spirit of what Isabella Gardner hoped her collection would provide for visitors– a place to consider and talk about works of art. Jenn, I wonder how much of this type of experience can also happen successfully in the galleries themselves. Have you found that having this separate space motivates more creative, social experiences that people may be more afraid of having in the galleries? And is there any transference to the galleries (do people take these experiences and bring them into their engagement with exhibitions and artworks outside of The Living Room)? Great questions, Mike. These are my questions as well. From talking with visitors and hearing hosts talk about the experience, I have a good sense that the project is helping visitors think differently about their museum experience. But we’d also love to really look at these questions in a more systematic way to see if we are achieving our goals and affecting our visitors’ experiences in a positive way. So, the next step is some evaluation using interviews with visitors. More on that soon.